Here's a look at new waterjet- and laser-cutting technology on display at Fabtech, held last November 14-17 in Chicago. 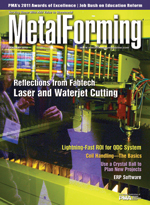 Look for additional coverage of technology displayed at Fabtech in coming issues of MetalForming. You and your company can influence what's happening "inside the belt." This is the first article in a series that MetalForming and Coe Press Equipment will present in 2012 on the basics of coil processing. The Precision Metalforming Association's annual Awards of Excellence in Metalforming recognize the high standards of achievement set by the metalforming industry in the areas of design, safety, process control, quality, productivity, product development, and training and education. When preparing to implement a new process, premortems provide a project-planning team with a process that helps to identify and address potential hurdles before they occur. Learn how die-change time dropped from 2 hr. to less than 30 min. at overhead garage-door manufacturer Steel-Craft Door Products. Payback for its quick-die-change system came in less than 6 months.